The Redemptorists » A novena to St. John Neumann, C.Ss.R. 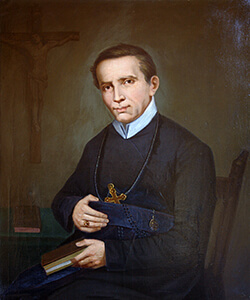 St. John Neumann, obtain for me a solid faith in all the teachings of the Catholic Church, along with the light to know the emptiness of earthly possessions, along with the seriousness of my sins. Obtain for me also the special favor which I ask through your intercession with God. Lord, in these days of pride and display, the humble ways of your servant, Bishop Neumann, inspire us to imitate your own divine example. Teach us to be like your servant, the holy bishop, intent on pleasing you first and on performing good deeds free from the desire to be seen and glorified by others. That his holy example may continue to influence others, grant the favors we ask through his intercession. Conclude with one Our Father, one Hail Mary, and one Glory be. St. John Neumann, obtain for me from the Father, through the merits of Jesus Christ, the intercession of the Virgin Mary, and your own prayers, the pardon of my sins, final persevering in faith, and the gift of paradise. Obtain for me also the special favor which I now ask through your intercession with God. Let us pray: Lord, in these days . . .
St. John Neumann, obtain for me a deep love of God that will detach me from the love of created things and from myself, to love him above all things and to seek his glory. Obtain for me also the special favor which I now ask through your intercession with God. St. John Neumann, obtain for me a perfecting accepting of the will of God that I may accept in peace the events of daily life and even death itself. Obtain for me also the special favor which I now ask through your intercession with God. St. John Neumann, obtain for me a deep sorrow for my sins, that I may ever grieve over the displeasure I have given my God. Obtain for me also the special favor which I now ask through your intercession with God. St. John Neumann, obtain for me a true love for my neighbor that will urge me to do good even for those who have offended me. Obtain for me also the special favor which I now ask through your intercession with God. St. John Neumann, obtain for me the virtue of chastity and the help needed to resist temptations by invoking the holy names of Jesus and Mary. Obtain for me also the special favor which I now ask through your intercession with God. St. John Neumann, obtain for me a strong devotion to the Passion of Jesus Christ, to the Blessed Sacrament, and to my Mother, Mary. Obtain for me also the special favor which I now ask through your intercession with God. St. John Neumann, obtain for me above all the grace to persevere in faith and trust in God, especially in times of temptation and at the hour of death. Obtain for me also the special favor which I now ask through your intercession with God. Learn more about St. John Neumann’s life here.